CCRI’s work to understand quality transfer partnerships between colleges and universities has revealed common characteristics of effective partnerships (Data Note 1), and different types of partnerships (Data Note 6). In Data Note 8, researchers dig deeper into the process of developing successful partnerships. As part of the High-Performing Partnerships study, CCRI researchers spoke to 201 faculty, staff, and students from institutional partners that have higher transfer, retention and completion rates than others in their state. Data Note 1 revealed that culture, policy and practice are the main categories of characteristics that define quality partnerships. Visits with the institutional pairs made it clear that even the best partnership practices ebbed and flowed over time. 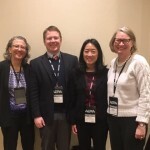 Researchers Theresa Ling Yeh and Lia Wetzstein discovered a number of factors that seem to either promote or prevent the progression of collaborative efforts to the next level. They highlight some of the elements that operate as catalysts and barriers to developing transfer partnerships in Data Note 8. 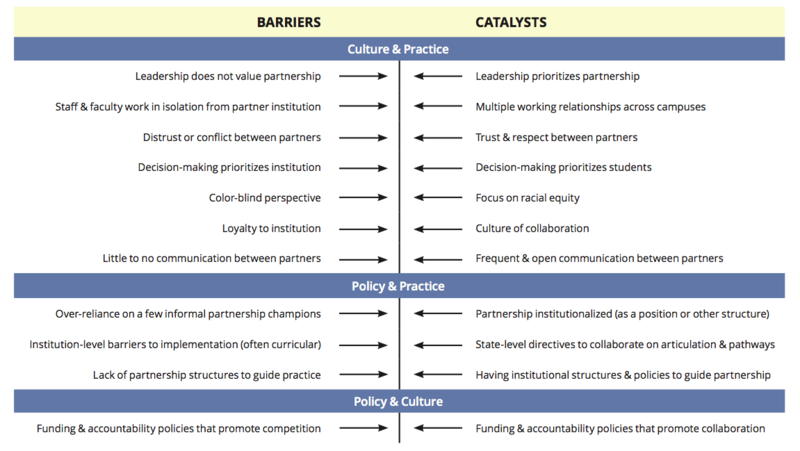 They also identified push-pull factors at each intersection that could be catalysts or barriers to partnership development. The diagram below illustrates these factors. For more information on this study and its findings, download the full Data Note below. This Data Note is part of CCRI’s High-Performing Partnerships Study (HPTP) funded by the Bill and Melinda Gates Foundation. The study focuses on how higher performing transfer collaborations between two and four-year colleges and universities work on the ground. Researchers identified high-performing partnership pairs from a dataset collected for the national initiative on reverse credit transfer called Credit When It’s Due (CWID). Read the full series of Data Notes and more about the project here. Sign up to receive monthly updates about our research.